Brunch is from noon to 2:30pm and is now $64.00 a person. In addition to the unlimited buffet items you also get to order one entree off their made to order menu which is below. To enlarge, please click on photos. The pricing for unlimited Veuve Clicquot or a comparable champagne remains a good deal at $35.00 per person, while other brunches such as Wynn's Country Club Jazz Brunch charge $50.00 per person. The buffet stations are along the lines of Country Club Jazz Brunch at Wynn. If you are looking for a huge selection of buffet stations then I suggest Caesars Palace Bacchanal Buffet or even Wicked Spoon's Buffet at Cosmopolitan. If you are looking for a zen atmosphere with a relaxing ambiance and high quality of food items then MOzen Bistro is a good choice. There are soups made to order, along with meat stations, sushi, seafood, and salad. The shrimp and crab claws are stand outs. I don't eat sushi but their sushi offerings looked excellent. There used to be a separate station for fruits but now that is part of the end of the dessert station which is in a separate room. The desserts in years past were always in this room but it was a larger table with a larger selection of desserts. Still there are plenty of desserts to select from and some of the fruit offerings in addition to the standard offerings are Dragonfruit, Kumquats and Passion Fruit. I had a server who in years past has always been great and she still is, however during this brunch she had a beginning assistant who was very slow to clear tables and also she had to correct him a few times in the way he presented a few items. Cocktail Shrimp, Crab Claws and the Mango Chicken Salad were all delicious. Gwen liked her Butter Chicken with rice and lentils that she ordered off the menu. The scallops I ordered were large, succulent and cooked perfectly. The server brought out a small cast iron skillet with yummy cinnamon glazed rolls. My selection of salads from the buffet, I liked them all. Gwen and I tried quite a few desserts. This photo shows the desserts I liked, the 2 parfaits and the macaroon with fruit. The pink dessert was a coconut mochi and the texture wasn't to my personal taste. In the past there was entertainment during brunch that I enjoyed hearing and as of the date of my writing this up the website for MOzen Bistro says that every Sunday, Mozen Bistro hosts a live jazz duo of guitarist and standup bass. However when we ate there in May there wasn't any entertainment. If entertainment is important to you while brunching you will want to call up and confirm they still have the duo preforming on the date you are dining there. 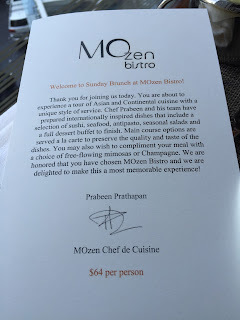 Even without the entertainment, a few server glitches, and the changes to the dessert station I would consider returning again to MOzen Bistro. For anyone who enjoys sushi I think this is an excellent brunch to consider for that!